Dr. Richard Bradley is Chief of the Division of Emergency Medical Services and Disaster Medicine at the University of Texas Health Science Center in Houston, which includes a fellowship in Emergency Medical Services. Before this assignment, he accumulated seven years of experience as Medical Director or Chief of Service at two major hospital Emergency Centers in Houston. 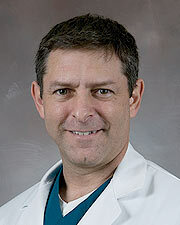 Dr. Bradley is a 1990 graduate of Santa Clara University. He completed his medical training at Georgetown University School of Medicine in 1994. Before graduating from college, Dr. Bradley accumulated ten years’ experience as a firefighter, paramedic, and 9-1-1 dispatcher. Since graduating from medical school, he has completed a residency in Emergency Medicine at the Stanford-Kaiser Combined Emergency Medicine Program and a Fellowship in Emergency Medical Services with the Houston Fire Department. Richard N. Bradley, MD, LP, FACEP serves as the Chief of the Division of EMS and Disaster Medicine at McGovern Medical School. His research interests are in the field of Emergency Medical Services and Disaster Medicine. He has over thirty years of out-of-hospital experience, including over a decade serving as a paramedic in a 9-1-1 system. He completed his fellowship in EMS with the Houston Fire Department (HFD) and served as an Assistant Medical Director for HFD for eight years. He continues to serve as the EMS medical director for a number of local EMS agencies. He has over fifteen years’ experience in the FEMA Urban Search & Rescue system, and currently serves as a Medical Team Manager with Texas Task Force One and is the Deputy Medical Officer for the FEMA White Incident Support Team. He has authored numerous peer-reviewed publications and frequently presents his work around the country. He is a regular reviewer for several scientific publications and he is the chairman of the CPR sub-council of the American Red Cross Scientific Advisory Council as well as being a board member of the Citizen CPR Foundation. Dr. Bradley has recently completed a nation-wide study of the out-of-hospital practices of EMS agencies in using airway management techniques. He has on-going projects evaluating emergency department utilization. Dr. Bradley also serves as the CPR Sub-Council Chairman for the American Red Cross Scientific Advisory Council. This organization produces four to six scientific reviews per year that summarize the latest scientific knowledge with respect to CPR. Dr. Bradley served as the Assistant Medical Director of the Houston Fire Department for eight years. He currently serves as the EMS Medical Director for the Harris County Hospital District and for San Jacinto College. He has seventeen years of experience in the Air National Guard, where he holds the rank of Lieutenant Colonel and is assigned to the 147th Medical Group in Houston. He has completed four military deployments overseas and served as the senior Critical Care Air Transport Physician in Iraq for Operation IRAQI FREEDOM. He also has extensive experience in Disaster Medicine and currently has additional duties as Associate Director for EMS Preparedness for the UT Health Science Center at Houston’s Center for Emergency Research. He has been a member of the FEMA Urban Search and Rescue System for sixteen years. He currently serves as a Medical Team Manager for Texas Task Force One and as the Deputy Medical Officer for the FEMA national Incident Support Team. His deployments include the 2002 Winter Olympics, the Space Shuttle Columbia recovery, and Hurricanes Katrina and Ike. He also continues to serve as a firefighter for the Pearland Fire Department.